Explain why you should limit changes to any primary instance group (PIG) during the holiday period. List two things that can display on a No Search Results page. Explain how sorting rules can be adjusted for post-peak days versus trailing peak days. List three types of people you need to check with prior to the holidays. Describe other resources you can use to learn more about holiday preparation. Before the holiday season starts, you need to make sure all the operational aspects of your storefront are ready for the big push. You don’t want to be blindsided by things going wrong during this key revenue-driving period. You want to do better than last year. You want to dazzle your shoppers with an amazing shopping experience. You want them to come back year after year and recommend your awesome site to their friends and family. That takes planning, action, and a little foresight. Take care of your systems. Avoid heavy operations on the staging and development instances during the highest peak hours, because all three instances on a PIG—production, staging, and development—share resources. Don’t move data or code during peak hours. You don’t want to introduce new code into the mix during your peak selling time, when every second counts. You don’t want to bounce an active shopper out of their cart. Give your CSM an updated list of emergency contacts. Submit a ticket to Salesforce B2C Commerce Customer Support a week prior to your peak about your traffic. Familiarize yourself with the escalation process for B2C Commerce and your integrations. Provide workload estimates to logistics and customer care prior to the peak. If your shoppers can’t find it, they can’t buy it. Optimizing site search for the holidays is a critical component of holiday readiness. Not only must you optimize search, but you must also review and modify your search dictionaries and tuning rules. 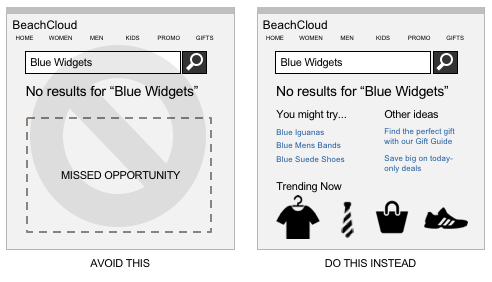 Review these areas to maximize your storefront’s search capabilities. Promotional Landing Pages—Create dedicated landing pages for discount, coupon, sale, and gift ideas; and configure the respective redirections. Type-Ahead Search—Implement this functionality, where a search begins as soon as the shopper types a few characters into the search field. This feature is expected by most shoppers. Synonyms—Create synonyms to link shopper terms to products and for misspellings. Hypernyms—Create hypernyms, a word with broad meaning that more specific words fall under. For example, color is a hypernym of red. Link specific search terms to specific product IDs. No Search Results—Every search must end with a result or a suggestion. Place a holiday gift guide on the No Search Results page to pique shopper interest. Use it to promote online exclusives or special offers using banners. Add a store locator or populate the page with product recommendations. Search Results Template—Use the content slot on the reference architecture’s search results template to promote categories, gift cards, online exclusives, or gift guides. Out of Stock or Discontinued Items—Monitor search analytics and see what popular products are searched for, but sold-out or discontinued. Offer the option to back-order out-of-stock products, or you can redirect to another category. Tune your site to make searching as snag-free as possible. Top Terms—Test your top 50 site search terms from the last holiday season. Holiday Terms—Optimize popular holiday specific terms such as Gifts, Gift Guide, Gifting, Stocking Stuffer, and so on. Common Misspellings—Add the most common misspellings to your dictionaries, and review weekly during the holiday season. Low-Conversion Terms—Track low-converting terms that are getting results. Are the correct items being returned? Redirects—Using redirects for holiday-curated categories. The holidays are coming like a freight train, so we’d better get ready. We can start by looking at holiday-specific scenarios that highlight the shopper’s view. What do we want shoppers to see as the holiday period approaches and on key shopping days? Let’s look at holiday-specific sorting rule scenarios for three key periods. The season kick-off whets the shopper’s appetite for the best deals of the season. They might not click that Add to Cart button right away, but you’ve caught their interest. Sorting rules control the order in which category and search results display the products. This is important because the products at the top of the results get a lot more shopper attention than the ones at the bottom. Review your sorting rules to ensure that shoppers have an easier time finding what they want to buy, and that you have an easier time promoting the items you want them to look at first. Sort holiday items to the top using search placement codes in sorting rules, and promote special holiday items by giving them the highest ranking. Reserve category position settings to promote specific items that are the most critical to your business. Use active data in your sorting rules, and sort the rest of the products by top sellers and revenue. Define what works best for your product range by conducting a few A/B tests before and during the peak part of the season. Use a longer period of time for active data during the rest of the year, but tighten it for the holiday season to 7 days (or even 1 day), as the sales volume increases. During the trailing peak days, your highest order days have passed, but there are still plenty of selling days left before Christmas. In general product categories, feature higher-inventory items with available inventory across colors and sizes using these attributes. SKU Coverage—Ratio between the total number of variants and their availability status. Available to Sell—Actual inventory of the style, including all its variants. Availability Rank—A ranking of high and low stock. If a product’s stock goes below 10%, for example, then the product is categorized into the low-stock group. Push products with high inventory along with a good SKU coverage to the top to avoid having products with a large inventory of one size and color sort at the top. If you have a Holiday Gift Guide category, feature remaining gift items with a similar availability coverage sorting rule or using manual positioning such as category position. In your post-peak days, you’re not only in a heavy sales period, but you’re also publishing your new spring catalog. It’s a great place to be! What you can do now is use the same or similar sorting rule that we just discussed. That means featuring your higher-inventory items across colors and sizing with an availability attribute—but now for a sales category. Many shoppers have learned over the years that the steepest discounts are given during this period. For your non-sale categories, create a unique sorting rule that highlights new arrivals above the fold, while pushing sale items to the bottom. Take a look at some holiday inspiration from past holiday seasons. Holiday Navigation—Update the navigation to highlight gift guides and special holiday categories. Use your homepage to feature holiday look-books, gift cards, and special holiday services. Holiday Policies and Special Services—Let your shoppers know about changes to your regular business practices during the holidays. Make seasonal policies clear and easy to find. Update existing search redirects to the holiday versions. If you have special services available only during the holiday season, feature them on your homepage. Want to learn more about holiday preparation? Continue your journey in the XChange Holiday resource center. You can find lots of tools to help you prepare for the upcoming holiday season. Sign up for Commerce B2C holiday webinars that focus on readiness, marketing, success stories, and optimization with Einstein. Be sure to check XChange for the full calendar and registration links. We learned how last year’s holiday analytics can help us get ready for the next holiday season. With our plan in mind, we can strategize our holiday promotions, giving shoppers an awesome experience. A growing part of that experience is mobile, and we’ll plan accordingly by offering alternative payment methods. We have lots to consider with systems, search, sorting rules, and of course, holiday-specific promotions. You’ve done an excellent job getting ready for the next holiday push. Now earn that excellent badge! See the Salesforce B2C Commerce XChange Community for technical details. Access to this community is granted upon contract execution.